Ss paint the flags of English speaking countries. 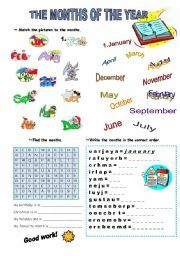 A worksheet to practise word formation with different prefixes and suffixes. 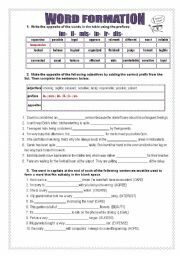 A grammar guide about modal verbs for intermediate levels(CAN, COULD, SHOULD, MUST, MAY, MIGHT) followed by exercises-3 pages. A test for elementary learners. 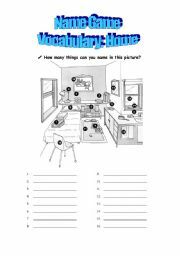 It has got four groups: reading comprehension, vocabulary (school subjects, school objects, telling the time), grammar (present simple of the verbs to be and have got,prepositions of time:in,on,at) and a composition. 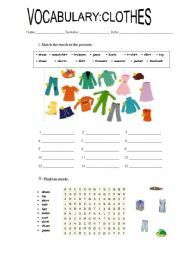 A worksheet for young beginners. 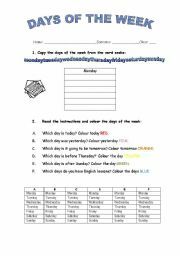 A worksheet about the days of the week for elementary students. I suggest using this worksheet with SS in pairs or in groups. The first group to name all the things in this room wins the game. Good to make Ss use their dictionaries if they have any doubts concerning vocabulary!